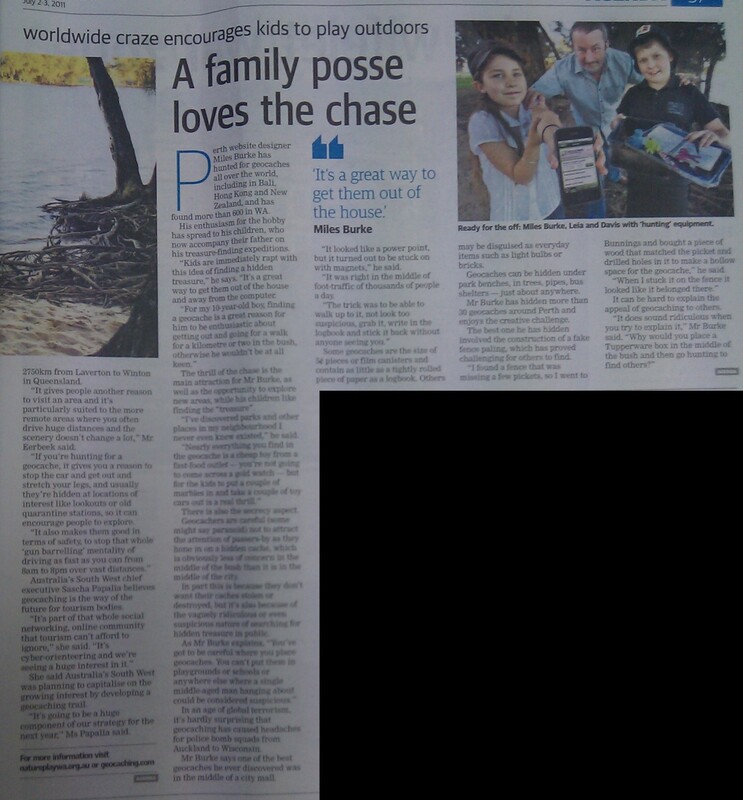 Geocaching often hits the media and we even produce some ‘media’ of our own. Here's mainstream media that we know about. Please add whatever you find! If you are from the media, check out our media kit. ABC News - Geocaching updates hide-and-seek with GPS coordinates, and ups and ante using puzzle boxes. Michael Atkin went along to discover the thrill of ferreting out shared treasure. March 2015: "Do Something New #6 - Geocaching"
AnneMarie White on Breakfast with Spencer Howson on 612 ABC Brisbane. August 2014: "The Geocachers Guide to the Galaxy"
July 2013: "Cache me if you can"
February 2012: "The secret world of Geocaching"
September 2011: "Geocaching is catching on as modern treasure hunting"
Article by Louise Merrillees on ABC News, WA. July 2011: "Everybody's going out a'hunting"
May 2011: "Chase the Cache"
Some have said Chase the Cache may be the coolest treasure hunt since Captain Jack Sparrow was around. Others have said it could be larger than The Amazing Race. All we know is that you better have your shoelaces tied tight because Chase the Cache will be an event not to be missed. Chase the Cache is a charity event created by Big Brothers Big Sisters. In this hi-tech treasure hunt teams will locate caches hidden around Docklands. Sign up your team for a fantastic day and show your support for Big Brothers Big Sisters. Geocaching Australia is a technology partner and supporter of Chase the Cache. 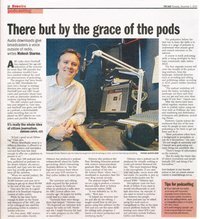 December 2010: "There but by the grace of the pods"
April 2010: "Play with me"
And a nice audio piece with transcript from ABC Newcastle aired on 9th April, mentions of the mega event as well. with a nice follow up looking at promoting tourism. 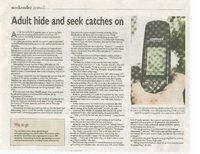 August 2009: "Searching for treasure"
Article in Victoria's The Age Livewire Section column, written by David Adams, featuring caughtatwork. 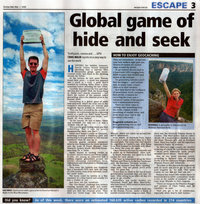 July 2008: "Calling all geeks"
Article in Tasmania's The Sunday Tasmanian's 'Bush' column, written by John Cannon. June 2008: "Club Stages Ultimate Treasure Hunt"
Article in NW Tasmania's The Advocate, with colour photo taken at "The First Ever Traditional Annual NW Tas BBQ" Event. April 2008: "High Tech City Treasure Hunt"
Follow up article on the recent Melbourne City Circle Scavenger Hunt in Techspace magazine (technology classifieds mag). April 2008: "Geocaching in Canberra Win TV News"
Great one page article, describing the fun and exercise that can be had from Geocaching. Featuring J!/\/\/\'/ and a friend with readers directed to Geocaching Australia for more information! 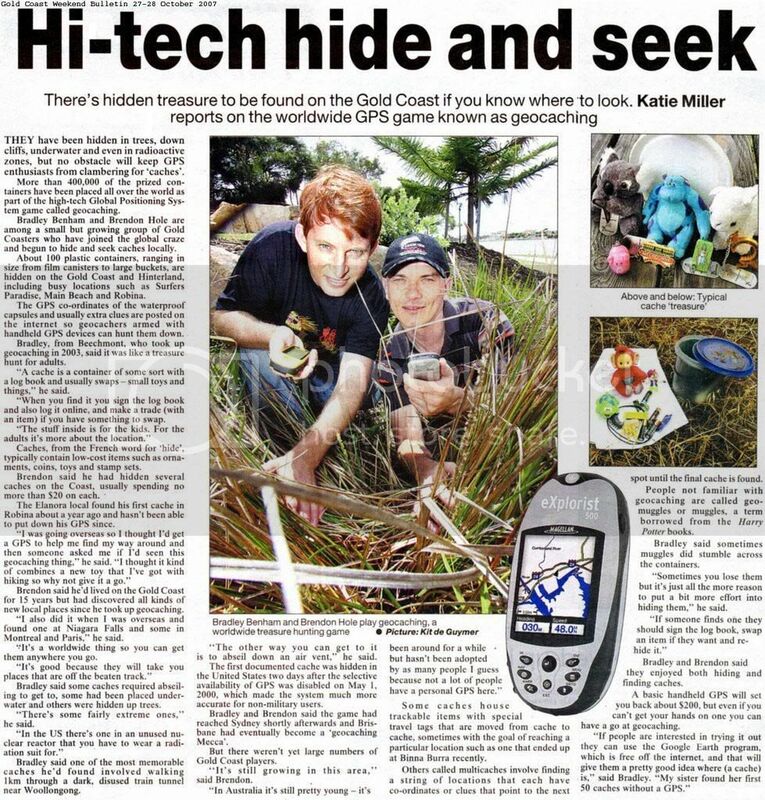 Great one page article, describing the thrill of the hunt from the reporters point of view with readers directed to Geocaching Australia for more information! 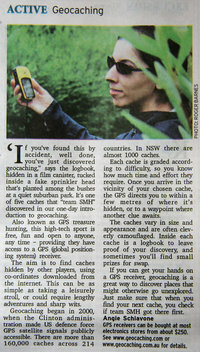 Great one page article, with readers directed to Geocaching Australia for more information! Article from the local rag there, mentioning real names of people I don't know. Apologies for the tears, it was given to me by someone who had torn it out of the paper! zactyl and Cannibal Smurf get interviewed about Geocaching. d.d.dudes interviewed for article in The Weekender, Sunshine Coast. Interview aired on ABC featuring audio from a cache hunt with Rhinogeo. 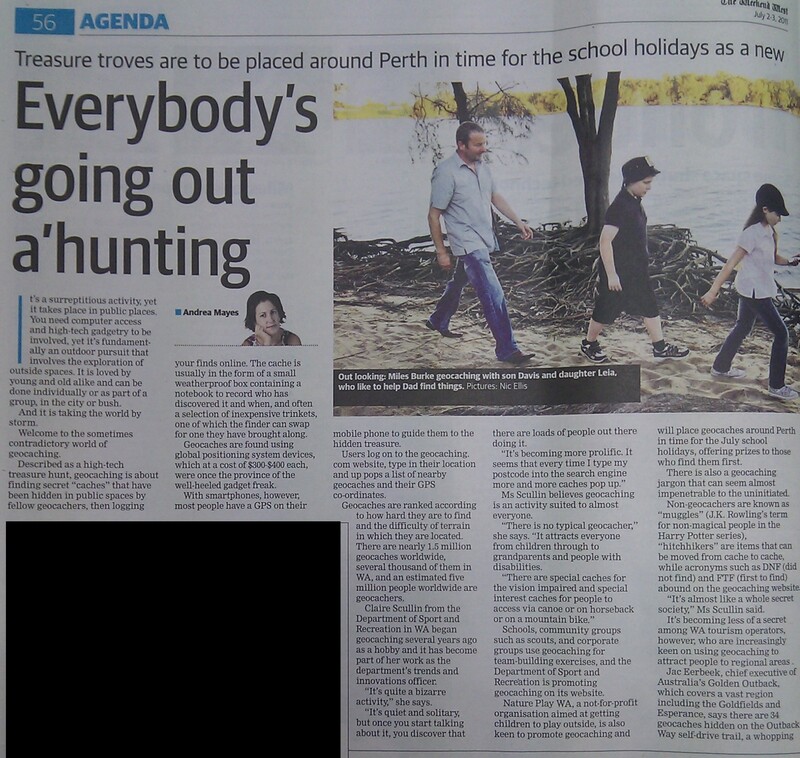 General article in the "Weekend" pull-out section of The West Australian newspaper. Informative item on New Zealand TV, featuring several prominent NZ cachers. 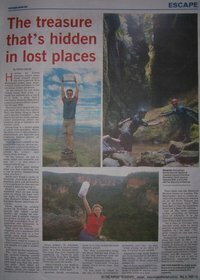 Positive article in Clare Valley Newspaper (SA), "The Northern Argue". The trick, I'm told it to find a picturesque location so that geocachers get something extra from the experience. Audio stream, in RealMedia format, requires RealPlayer. 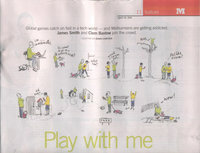 Published in The Sydney Morning Herald, Spectrum Magazine (pg 32). Mind Socket took a couple of buddies geocaching for an introductory article that was published with one of his photos. Contains a minor cache spoiler (cache not named). Published in The Sunday Telegraph This is a reprint of the previous article for NSW readers. Includes photos of Mind Socket, EcoNic and EcoDave. Published in The Adelaide Sunday Mail and online at Escape. HUNTING for hidden treasure, David Jones found himself abseiling into a narrow Blue Mountains gorge, past moss-covered rocks and ferns to the trickling stream far below. They are everywhere - in fact you may have walked right past one. Dozens of caches are tucked away around the world. To get started all you need is a hand-held GPS (ranging from $200 to more than $1000) and access to the Internet. On geocaching websites you'll find the longitude and latitude and, in many cases, cryptic clues as to their location. And then there's the backpack of must-haves: torch, compass, first-aid kit, a camera for recording the event and a calculator (many of the puzzles have a mathematical bent). write about your visit in the container's log book. An increasingly popular game of grown-up hide-and-seek is leading adventurers on high-tech hunts for hidden treasure. It's called geocaching, and all you need to play is a portable Global Positioning System, access to the internet and a sense of adventure. On 21st October, 2001 Team Chaos members Captain Chaos and The Ginger Loon were interviewed by Chris Bullock from ABC Radio station Radio National. The topic was Geocaching and GPS usage. The information gathered was broadcast as a part Radio National's "Background Briefing" program focusing on GPS, which went to air on Sunday 18th November at 9:00am and was repeated on Tuesday 20th November at 7:00pm. This page was last modified on 19 July 2016, at 12:46.